Researchers Have Discovered A 16th-Century Facebook. Sounds Impossible, But This Is Fascinating! Today, more than one billion people are active on Facebook. However, most don’t know that the idea of a “social network” has a long, vibrant, and curious history. And while today we see things like viral emotional videos posted on Facebook, “social media” was used a little differently back then. They would travel and meet new people, make new acquaintances, and use these books to share their favorite songs, opinions, and comments. The trend started when young men left home and visited famous universities and scholars. Eventually, a vast majority of high society started exchanging their ideas in these amazing books. Most people tried to gather as many entries as possible in their books, as it was a sign of status and popularity. Scroll further to take a look inside these fascinating 16th century friend books. Let us know what you think in the comments below! Ph.D. scholar Sophie Reinders, who is writing her dissertation on these incredible books, said that they were used first and foremost to establish professional and personal relationships. Young noblemen from the regions of present-day Netherlands, Germany, and France would take these books with them on their travels throughout the continent. Along the way, they would meet brilliant scholars, philosophers, artists, and scientists. 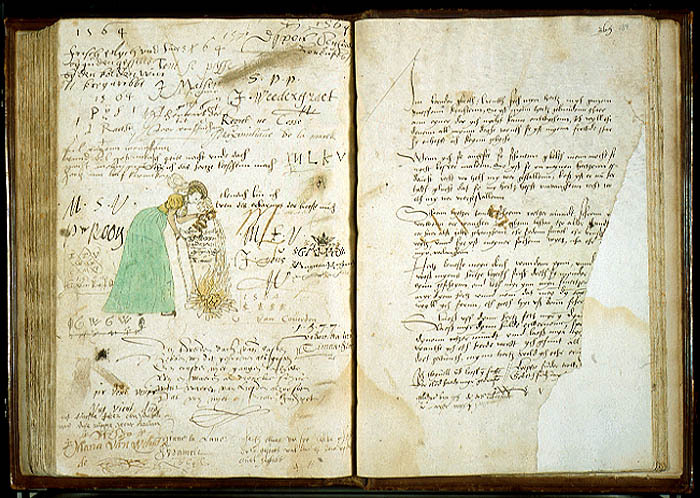 To document their meeting, the young men would ask for others to write short entries in their friend books. These young men amassed as many entries as they could, hoping that these professional connections could help heighten their status — sort of like a 16th-century LinkedIn! They would also commission famous artists to paint scenes from their adventures in the friend books. In those days, however, women had little opportunity to travel extensively. But that doesn’t mean they didn’t make full use of their friend books. In fact, their friend books more strongly resembled Facebook as we know it today. Many young noble girls were sent to convents or to courts as ladies-in-waiting. While there, they used their friend books to mark friendships, exchange gossip and stories, trade advice and jokes, and reveal their secret crushes. Instead of sharing fun or entertaining articles — like we would do on Facebook today — they used their books to share biblical passages. And instead of videos and songs, they "posted" written lyrics and poetry. These books also featured “event pages.” Guests would write down their favorite memories of the parties, and couples would pen their relationship status after they wed.
Because they were passed around more frequently, the girls’ friend books tended to be more cluttered. “The alba kept by women are mostly full of ugly, busy pages, on which up to 15 people scribbled down their name, motto, or a short saying,” Reinders told Mental Floss. Obviously, these friend books enriched 16th century life. But today, they are one of the special ways for us to understand the creative minds who came before us. These friend books are absolutely fascinating, and capture the essence of human networking as we know it today, and as we will always know it. Please SHARE if you learned something incredible!